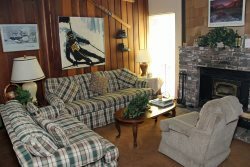 3/35: Mammoth Condo Rental Snowflower 37 - Living Room with a Large Flat Screen TV, DirecTV, access to outside deck. Above Standard, 2 Bedroom, & Loft & 3 Bath Town home located in the Scenic Meadow area of Mammoth Lakes. Sleeps up to 8. Washer/Dryer in unit, Direct TV and free WiFi. You enter the unit on the first floor which has both bedrooms and 2 full bathrooms. The second floor is the living room, kitchen, dining room and 1 full bath, and the third floor is the loft (open into the living room by a half wall). Each bedroom has 1 queen bed, (new memory foam queen mattress in the master Nov. 2014), the loft has 2 twins and 1 queen bed. Some renters love the Tempurpedic mattress and other do not. There are tempurpedic toppers on the two other queen size beds. The singles were purchased 5 years ago. 4 Flat Screen TVs (one with built in DVD), 3 VCRs/ DVDs, Bose stereo/CD player, IPOD docking station/alarm clocks. Wifi is Verizon DSL in unit for a bundled plan with unlimited local calls, no free long distance and 7.1mbps DSL with an unlimited data plan. The living room is furnished with a roomy leather sectional sofa and large 50" HD flat screen television, complete with Sony Theater Sound System and DVD. Phone in unit 760-934-2048 (1300 Sq. Ft.) Nice views of Mammoth Mountain and the Sherwins. Unit overlooks the Snowflower tennis court. There are a maximum of two outdoor parking spaces available. There are no Buses, Motorhomes, Trailers or any type of Towed Vehicles allowed on the Snowflower property. Snowflower Features a Hot Spa and Sauna, Summer Time Only Swimming Pool, Tennis Court, and On-Site Laundry. COMPLIMENTARY INTERNET and DIRECT TV are provided, however NO REFUNDS will be given for connectivity problems or Internet failure. TOT LICENSE 807-SF37. Thanks. My family and kids enjoyed the stay at your place in Mammoth lakes. We will visit again next year. Very nice place and location. My family had a great time. If you ever want a cozy, easy and fun stay in Mammoth check out this place! Easy check in, kitchen was fully stock with all the dishes and pots and pans you could ever want & it even a griddle! My family (with little children & grandparents) all fit comfortably in our condo! Thanks CRoM for a great stay with lots of great memories to look back on and remember! Mahalo! We enjoyed our stay very much and wished our vacation could have lasted longer. This is our second year in a row that we have chosen to rent SF 37 through your agency. Things we particularly liked about the accommodations: - glad that the Internet speed was much better this year and we very much appreciated that - "host" in the office at Sunrise very nice and helpful with exchanging linen, obtaining more toiletries - view from condo always nice; tennis court in good shape - like how obtaining the keys in the office and returning them is so easy/trusting. Overall, had a great time, barbequed at the communal bbq a couple times, and truly enjoyed the Mammoth weather and fishing. We enjoy working with Central Reservations. SF37 was really excellent, one of the best stocked condos we have stayed in, and we have stayed in Mammoth a lot. For us, the proximity to the tennis court was a number one feature. Second was the well-stocked kitchen. Lots of silverware, dishes, utensils. We also were amazed at the number of tv sets, all of which worked fine. The couches and chairs were outstanding, some of the most comfortable that I have experienced in any condo. All in all, the unit was exceptional. Thank you for your email; we had a great time! There isnt anything that comes to mind that could be improved upon. The reservation process was very easy, the condo keys were ready and waiting for us when we arrived and the condo was clean and provided all the amenities of home. We are looking forward to returning to Mammoth again soon and would definitely use your services again. We really enjoyed our vacation week in Mammoth; wish we could have stayed longer! Enjoyed best: view from the condo, tennis court, weather (even though thats beyond anyones control, but we loved it! ), convenient condo-close parking, quiet unit (no neighbor or street noise), friendly manager at Sunrise Office.